The HubSpot CRM includes 15 calling minutes per month per user, without the option to purchase additional minutes. There can only be 50 calls made per month per account. HubSpot Sales Hub Starter and Service Hub Starter includes 500 calling minutes per month per user, without the option to purchase additional minutes. HubSpot Sales Hub Professional and Enterprise and Service Hub Professional and Enterprise includes 2,000 calling minutes per month per user, with the option to be billed for additional minutes (see below). An alert will appear in your HubSpot account when you're within 100 minutes of your calling limit. If you reach your limit while on a call, you will be able to complete that call, but will not be able to make additional calls that month. Your call minutes will reset on the first day of each month. If you are a Sales Hub Professional or Enterprise user or a Service Hub Professional or Enterprise user who reached the limit of 2,000 calling minutes for the month, you can use Twilio Connect to buy more calling minutes from Twilio, HubSpot's third-party vendor. This is on a per user basis and will not apply to the other users in your HubSpot account. Please note: using Twilio Connect allows a user to call countries outside of the supported country list, but only after the user finishes their existing HubSpot calling minutes. In the Twilio Connect section, click Connect an account. 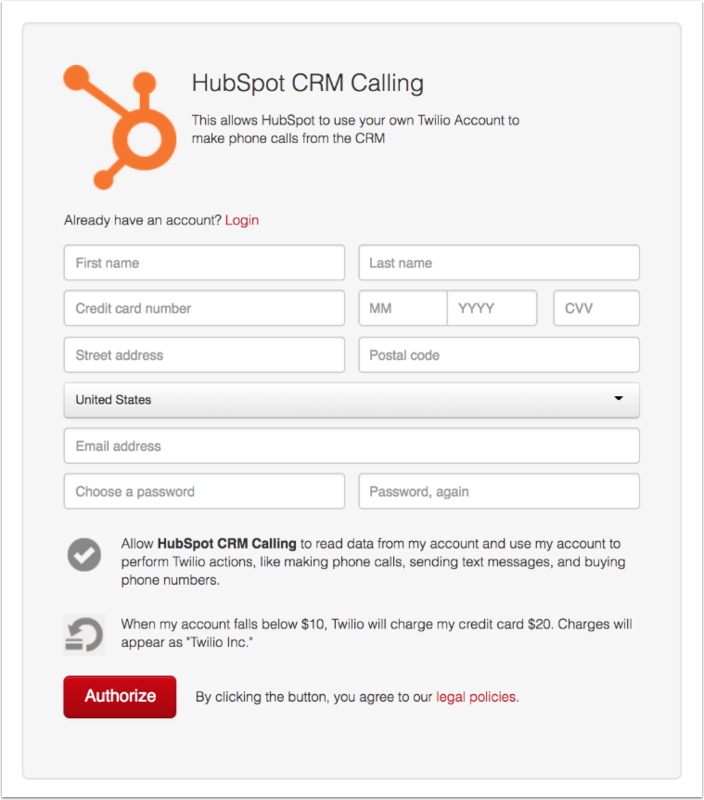 You'll be redirected to Twilio to create an account or log in to your existing account to authorize the connection to HubSpot. Once your Twilio account is connected, you'll be redirected back to HubSpot. 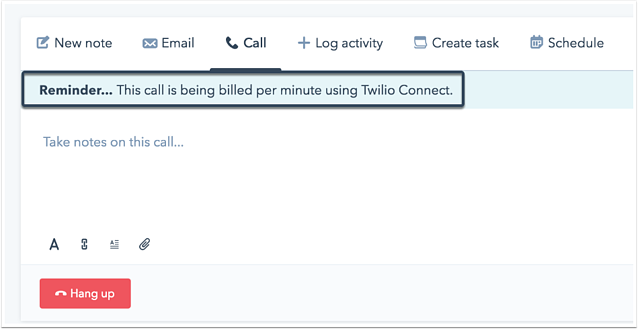 When you make a call to a contact using additional minutes, a banner will appear at the top of the Call tab in the contact timeline reminding you that the call is being billed per minute through Twilio Connect. You can view the number of additional calling minutes used and the amount billed for the month in the Twilio Connect section. Please note: Twilio's pricing for additional calling minutes varies based on the location of the caller and the recipient, and there is no markup to the pricing from HubSpot. How you place the call also affects minutes usage. When using the Call from phone option, you will be charged for each leg of the call. The first leg is the connection between your phone and Twilio. The second leg is from Twilio to your contact. The listed call rates are per leg. Just as Call from phone uses double the amount of HubSpot-included minutes, this option will charge you twice as much when using Twilio Connect.